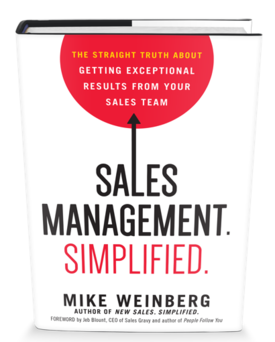 Mike Weinberg is a consultant, sales coach, speaker and author on a mission to simplify sales. His specialties are New Business Development and Sales Management, and his passion is helping companies and individuals acquire new clients. Prior to launching his own firm, Mike had been the top-producing salesperson in three organizations. Forbes, OpenView and several other publications have named Mike a Top Sales Influencer. Amazon lists 30,277 books on sales management and yet they named “Sales Management Simplified” as one of the best books for 2015. 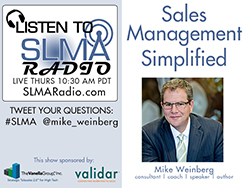 We originally heard Mike on an episode of Sales Pipeline Radio which is also on the SLMA Channel. 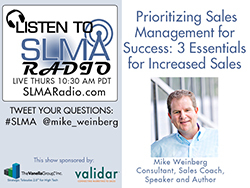 During this 30 minute program SLMA Radio host Jim Obermayer interviews author Mike Weinberg about what it takes to be a great sales manager and how his book has been received since its publication in October of 2015.
salesperson in three organizations. Forbes, OpenView and several other publications have named Mike a Top Sales Influencer.